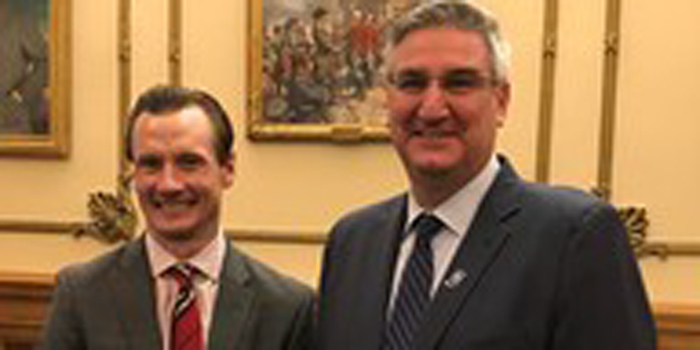 Indianapolis – Late this morning, Jan. 23, 2019, the president and board members of the Bolt For The Heart foundation were welcomed to Governor Holcomb’s office for a personal “Thank you” for donating an additional 134 AED units to the Indiana State Police. This brings the total number of AED units donated to the state police to 465 and marks the fulfillment of a 2014 pledge by BFTH to put an AED in state police road patrol vehicles. The value of this donation exceeds $600,000. Gov. Holcomb visited with Pierre Twer, the president of the BFTH, a non-profit organization, along with BFTH board members, corporate friends of BFTH and state police officers that recently received an AED the result of the latest fund raising drive held on Thanksgiving Day last year. The donation of the AED’s to the state police was borne the result of an experience Twer had while running in the 2010 Boston Marathon. During that race, Twerk witnessed another marathon runner suffer a cardiac arrest. That runner was saved by an AED. This inspired Pierre to collaborate with Heart Reach Carmel and establish the Bolt for the Heart 5K Family Thanksgiving Run. Since its inception, this 5K run has grown from 41 runners to more than 3,000 that participated this past Thanksgiving Day run or in a virtual run held at locations across Indiana.